On February 1, 1968, while on the job emptying trash in a white neighborhood, Memphis, TN sanitation workers Echol Cole and Robert Walker huddled in the back of their truck to seek shelter from a storm. When the truck’s compactor suddenly malfunctioned, the two became trapped and were crushed death. Today across the country, Machinists Union members took part in a moment of silence in their memory sponsored by the AFL-CIO, AFSCME and the Church of God in Christ. #OTD 50 years ago we lost two Memphis sanitation workers, Echol Cole and Robert Walker, due to poor working conditions. Their deaths sparked a nationwide movement for justice and equality. 50 years later, the tragedy stands as a pivotal moment, which forever bonded the struggles for, civil and labor rights in this country. 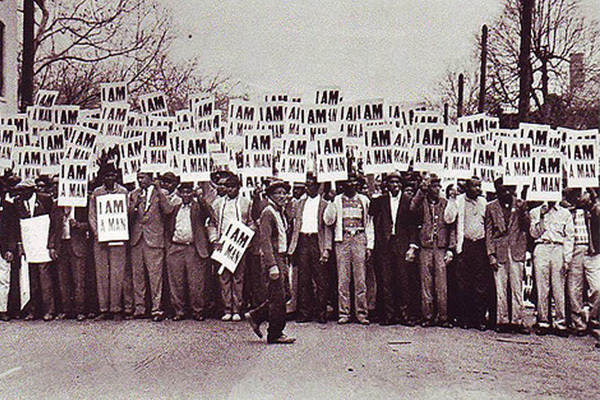 When outraged Memphis sanitation workers went on strike and demanded better pay, safer working conditions and recognition of their union, other unions including the Machinists joined the men. National attention became unavoidable when Dr. Martin Luther King, Jr. arrived in support. It was in Memphis that King was assassinated on April 4, 1968. The strike successfully ended 12 days later, when the city agreed to raises for the African American workers and recognition of their union.